« Complementary Therapies Explained – What is Applied Kinesiology? 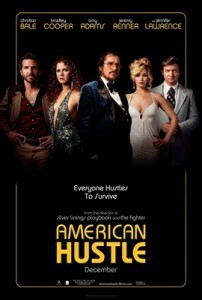 American Hustle, directed by David O. Russell, who also directed last years critically acclaimed “Silver Linings Playbook,” has struck gold again in the director’s chair with another excellent cast of top notch actors. Hustle is a crime drama comedy loosely based on the Federal Bureau of Investigations(FBI) ABSCAM operation. ABSCAM was a Federal Bureau of Investigation (FBI) sting operation run from the Bureau’s Hauppauge, Long Island, office in the late 1970s and early ’80s. The FBI, aided by a convicted con-man, videotaped politicians as they were offered bribes by a fictional Middle Eastern sheik in return for various political favors.The investigation ultimately led to the conviction of a United States Senator, six members of the United States House of Representatives, one member of the New Jersey State Senate, members of the Philadelphia City Council, the Mayor of Camden, New Jersey, and an inspector for the United States Immigration and Naturalization Service. Christian Bale plays Irving Rosenfeld. Irving is obsessed with “making a buck.” He gets into the Conman game early as a kid and enters adulthood busting windows of businesses and then offering window repair. Bale loves to get deep inside his characters. So much in this film that he puts on at least 30 pounds of weight and cuts his hair into a balding comb over. Amy Adams plays Sydney Prosser. Sydney is a good looking woman looking to come up in the world. Irving and Sydney meet at a party and become inseparable. Even though Irving is a married man who doesn’t want to leave his crazy wife (Jennifer Lawrence who shines in this role ) for fear of never seeing the adopted son whom he loves. Sydney goes on Irving’s ride so to speak, enhancing Irving’s cons. The ride is good until FBI Agent Richie Di Maso (Bradley Cooper) catches Irving and Sydney in a loan scam, but offers to release them if Irving can line up additional arrests. The two con artists are forced to set up a sting on corrupt politicians and the mayor of Camden, New Jersey (Jeremy Renner)by agent Di Maso. They bribe the mayor of Camden (Renner), local politicians and a Senator played by one of my favorite character actors Anthony Zerbe (The Omega Man 1971) into believing a rich Sheikh would like to invest in casinos in Atlantic City, NJ (Atlantic City, NJ is a major Casino hub on the East Coast of the United States today). As the con grows the Mafia becomes involved as a necessary part of business. Carmine (Renner) brings the Sheikh to a casino party. Irving is surprised to see that the violent Mobster leader Victor Tellegio (Robert De Niro), second-in-command to the infamous Meyer Lansky, is present. One of the most outrageous scenes in the movie unfolds when Irving sees Tellegio at the party. Irving wants no part of meeting with Tellegio. He stays standing on the other side of the room with Carmine, Sydney and the Sheikh. Irving’s wife Rosalyn (Jennifer Lawrence), who is already upset that Irving has brought his mistress asks, “Why are afraid of those guys?” (The MOB!) ”They don’t look scary to me.” And struts over to the meanest guys in the room and strikes conversation. She later starts an affair with one of the mobsters and almost gets Irving killed.. Wanting no part of the Mob Irving hatches a con where he hides millions in bribe money from the FBI and says an anonymous source will return the money in exchange for immunity for Irving and Sydney; and to keep them away from the mob. Agent Di Maso’s superiors accept the offer which dashes all Di Maso’s plans to become a famous FBI agent. In the end the mob lets Irving live out his life. Irving and Sydney open a legitimate Art business together and Rosalyn and Irving, divorced, share custody of their son.